According to multiple outlets, Matthews is currently in police custody. Federal prosecutors confirmed the arrest Wednesday night. Over a span of 10 days beginning in late March, three predominantly black churches in St. Landry Parish, La., were set ablaze, reduced to ash and ruins. The first church destroyed was St. Mary Baptist Church in Port Barre on March 26. A week later, Greater Union Baptist Church in Opelousas burned down, followed by Mount Pleasant Baptist Church, also in Opelousas, on April 4. No one was injured in the blazes, as the churches were empty at the time of the fires, officials say. 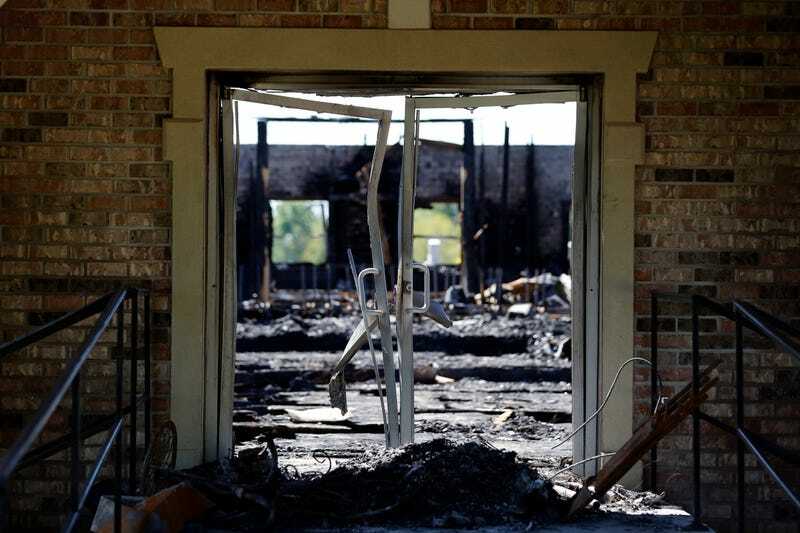 It’s unclear whether a fourth fire, at a predominantly white church in Caddo Paris (about three hours away from the site of the other fires), is connected to the string of arsons. Meanwhile, more information is being uncovered about the suspected arsonist, the son of St. Landry Parish Sheriff’s Deputy Roy Matthews. As the Daily Beast reports, the younger Matthews appeared to follow black metal and paganism, occasionally posting on social media pages dedicated to these interests. While both have connections to Neo-Nazism, white supremacy and white nationalism, current reporting doesn’t yet show much of an online connection between Matthews and these racist, far-right movements. Vikernes, a practitioner of pagan beliefs, described the arsons as having been “revenge” for Christian actions against pagan Viking graves. Vikernes has been cited by other far-right killers. Norwegian white supremacist Anders Breiviksent Vikernes a copy of his manifesto before going on to kill 77 people. Atomwaffen Division, a U.S.-based neo-Nazi group with multiple murders to its name, has cited Vikernes books on paganism on their website. Matthews commented on two memes about Vikernes. Neither comment was particularly revealing, but they indicated his familiarity with the fringe figure. Johnson also pointed out that the blazes were nothing new. At a news conference Thursday morning, Louisiana governor John Bel Edwards referred back to that history. “It has been especially painful because it reminds us of a very dark past of intimidation and fear,” Edwards told reporters. But as this disturbing series of fires may show, that legacy of intimidation and destruction has not faded quite so deep into the past as many would hope. If convicted, Matthews faces a maximum sentence of 15 years for each arson charge. Church Member Charged in ‘Vote Trump’ Vandalism, Burning of Black Church in Miss.